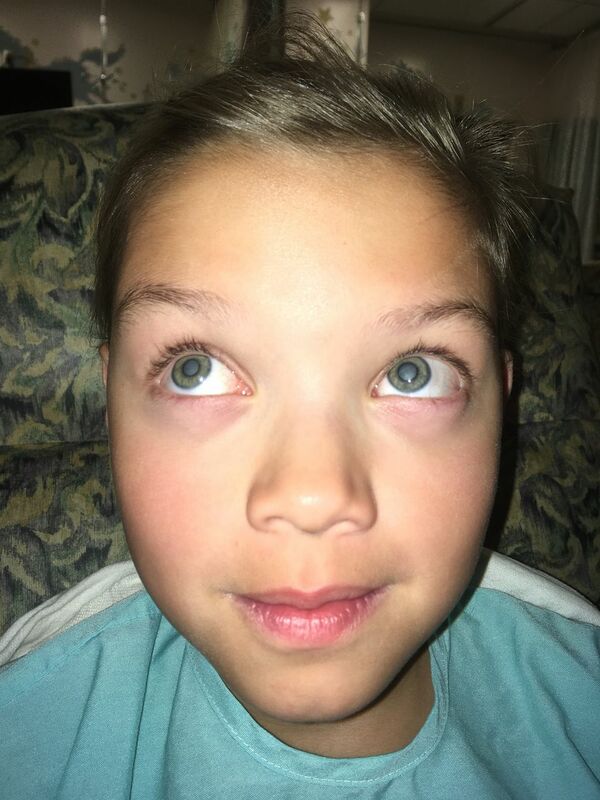 A 10-year-old white girl with newly diagnosed type 1 diabetes mellitus (T1DM) presented with progressive deterioration of vision in both eyes within 4 weeks of diagnosis. She had a 3-month history of polyuria, polydipsia, nocturia and generalised hair loss prior to diagnosis. Physical and neurological examination was unremarkable. Baseline ophthalmological examination did not show any diabetic retinopathies. Laboratory findings at presentation include: haemoglobin A1c (HbA1c) of 16.8% (normal 4.3%–5.6%), glucose of 763 mg/dL (normal 60–100 mg/dL), bicarbonate of 15 mEq/L (normal 22–32 mEq/L), anion gap of 24 (normal 3–13) and beta-hydroxybutyrate of 6.22 mmol/L (normal 0.02–0.27 mmol/L). She was started on a basal (glargine) and bolus (lispro) insulin regimen. Follow-up 1 month after diagnosis showed that her glucose readings were at the target range of 90–150 mg/dL while receiving a mean daily insulin dose of 1 unit per kg. However, the patient’s mother was concerned about her daughter’s loss of independence due to a rapid decline in vision. Physical examination showed visual acuity limited to identification of colour and seeing moving shadows (‘hand motion’ vision) due to lens opacities in both eyes (figure 1). Red reflex with direct ophthalmoscope revealed blunted, whitened reflex bilaterally. 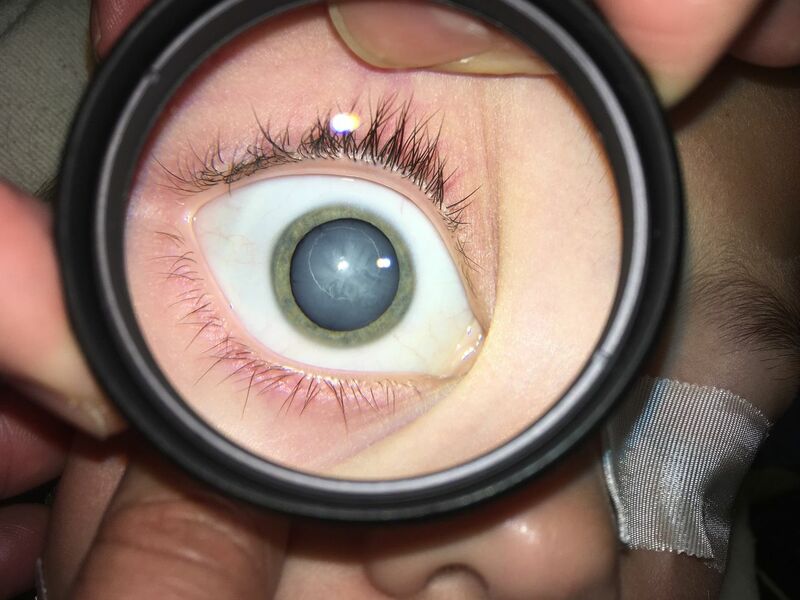 The paediatric ophthalmologist confirmed the presence of bilateral dense, white cataracts without peripheral sparing and associated anterior chamber narrowing via dilated slit lamp examination (figure 2). Bilateral eye opacities as seen on physical examination of an adolescent girl with newly diagnosed type 1 diabetes mellitus. Dilated eye examination of a 10-year-old girl showing dense white cataract of the right eye. Current guidelines recommend screening for chronic ocular complications starting 3–5 years after diagnosis of T1DM. However, these recommendations largely pertain to diabetic retinopathy and changes in the posterior vasculature of the eye over time. This case showing accelerated development of cataract within weeks from diagnosis is a good reminder to review eye examination in newly diagnosed patients with T1DM especially among those presenting with worsening vision despite improving glucose control. Cataract development can occur early in disease course or at the time of diagnosis in patients with type 1 diabetes mellitus (T1DM). Cataract should be a differential diagnosis in patients with T1DM presenting with a blurring of vision despite improving glycaemic control. Diagnosis in adolescence, and longer prodromal periods prior and higher HbA1c (>12%) prior to diagnosis are risk factors suggesting earlier eye examination among newly diagnosed patients with T1DM.
. High rates of ocular complications in a cohort of haitian children and adolescents with diabetes. Yearbook of Paediatric Endocrinology 2018:1124–30. Contributors JBQ wrote the first draft of the manuscript and edited, with direct care of the patient. APT edited the manuscript. MAS performed data collection, edited manuscript and was involved with direct care of the patient.